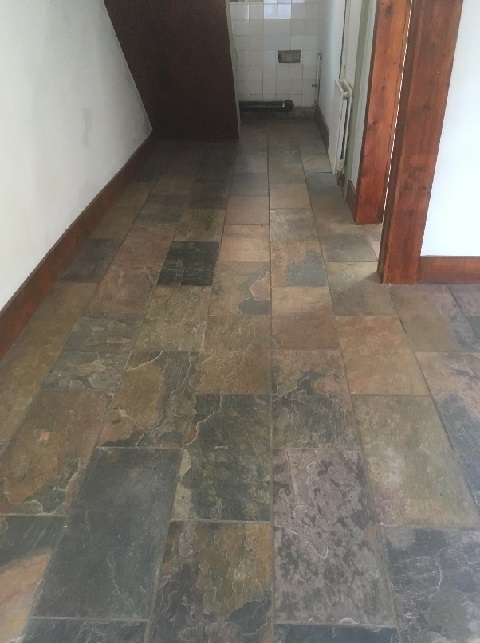 This customer in the coastal village of Heysham had recently had these beautiful Copper Slate Tiles laid by a builder who had been working on the house. As part of the work he also sealed them with a solvent aerosol sealer. 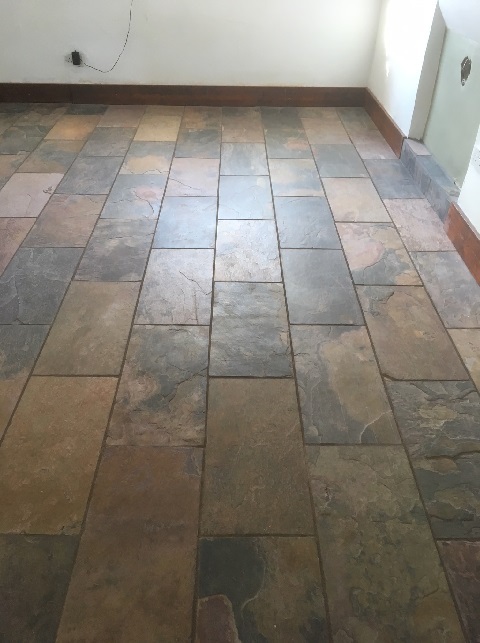 Floor tiles experience a lot of wear from foot traffic and as a result the sealer only lasted about two weeks before it had worn off and dirt had started to penetrate the pores of the stone. The photos below were taken two months after they were sealed. Aerosol sealers are only good for wall Tiles where they experience minimum contact, we usually only recommend their use for shower cubicle or wet rooms and they need constant topping up every 6 months or so. In our experience floor surfaces receive a lot of abrasion from the traffic of shoes and so on which will diminish an aerosol applied sealer very quickly. 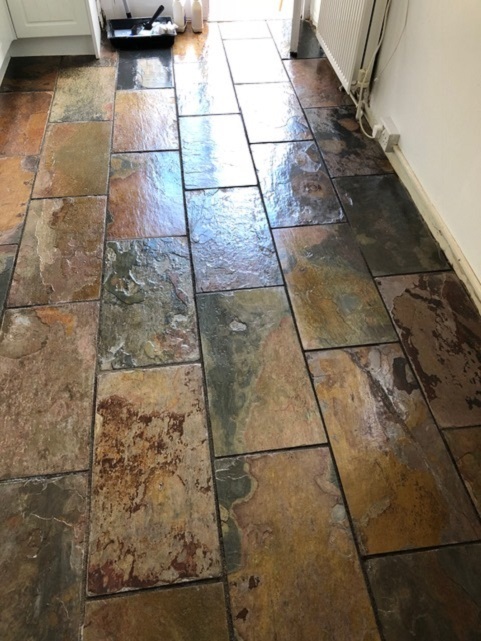 It makes sense to clean tiled floors before applying a sealer otherwise you simply trap the dirt under the seal which will reduce its appearance. So before re-sealing the floor with something more effective it was treated to an abrasive clean using a 200-grit diamond encrusted floor burnishing pad fitted to a weighted buffer machine. The pad was run over the whole floor using water to lubricate and with the machine running at slow speed to reduce splashing. Next step was to clean the recessed grout which pads can struggle to reach, this was done by applying a dilution of Tile Doctor Pro-Clean along the grout lines and then scrubbing it in with a stiff grout brush by hand. Once done the residue from the tile and grout cleaning was rinsed off the floor with water and then extracted with a wet vacuum. The floor was left to dry off completely overnight and I returned the next day to re-seal, this time with a more suitable product. 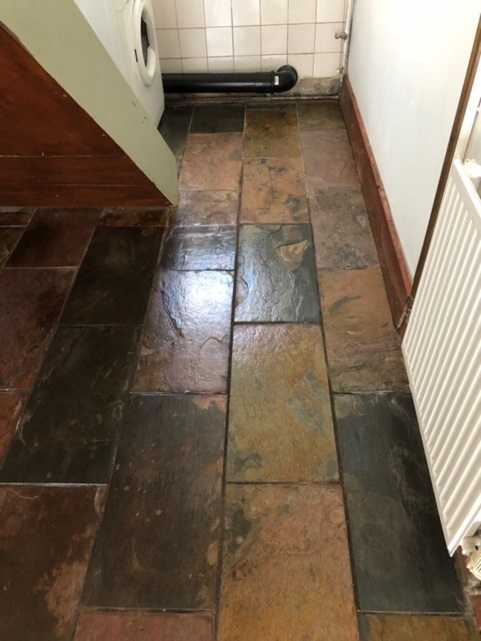 My sealer of choice for Slate is Tile Doctor Seal and Go which will not only protect the stone from dirt and staining but also adds a very pleasing sheen finish. The new sealer really brought out the black and copper colours in the stone and now looks amazing. For long-term care I always recommend customers avoid the use of steam cleaners and acidic or strong alkaline cleaning products which can prematurely reduce the life of the sealer resulting in dirt becoming trapped in the pores of the stone again. Naturally Tile Doctor have designed a product for this which is called Tile Doctor Neutral Tile Cleaner, supplied in concentrated form when diluted with water it becomes pH neutral and safe to use on sealed surfaces. I always leave my customers with a complimentary bottle after cleaning their floor, so they are reminded what to use.